With the festive season just upon us it can be easy to go a bit overboard and indulge. Christmas parties, get togethers and visiting relatives always seem to include an excess of mince pies, chocolates and alcohol. But these festivities don’t have to undo your health and fitness efforts. You can still socialise and enjoy yourself with friends and family while at the same time being healthy. 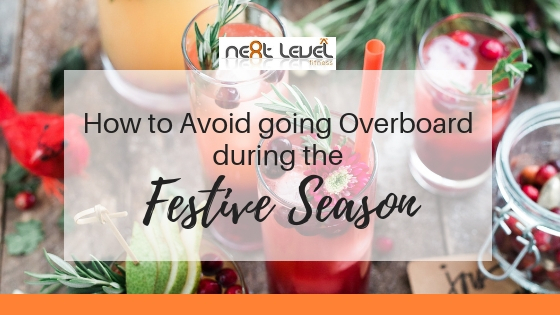 Follow these 7 tips to help you make the right choices and survive the festive season. When you focus only on what you cannot do things can seem a bit daunting. You won’t enjoy yourself over the holidays if all you do is think about what you can’t have. Instead you need to look at what you can do and what you can have. There are plenty of options for how you spend your time. Just because a lot of people are heading to the pub and overdoing it with the pints doesn’t mean that you have to as well. Chances are you know at least one person who wants to avoid this kind of indulgence. You can go easy on yourself and allow yourself a couple of treats. Pick a few things that you will let yourself have (without overindulging) and stick to those. This means that when you go visiting family or head out with friends can enjoy your favs but still avoid all the others treats on offer. Remember that the festivities are not just for a day or two. The weeks leading up to Christmas are when most people do damage to their healthy lifestyle. Be conscious of the build-up and all the foods that are a part of it. This is something a lot of people do once they know visitors will be stopping by. Having something to offer guests is fine but you don’t need to stockpile. Heading out for winter walks or going ice skating are both great ways to keep up your healthy lifestyle and to spend time with the kids. Having a small meal or snack before heading to a party will stop you from constantly picking from the buffet. And speaking of parties, don’t let yourself get pressured into accepting more food or more drinks. What will you do to stay on track during the Christmas period?